A few people have commented that The Garden at the End of the World doesn’t show much permaculture, so I have been compelled to write this blog. It is true that Rosemary doesn’t get her hands into the soil and help the people grow food. However, in fact, the film is full of permaculture – although it is not the permaculture that most people are familiar with. The Garden at the End of the World’s primary theme is the effect of war on the women and children of Afghanistan, but the film also documents the pioneering of permaculture in Afghanistan, focusing on the integral first stages of re-building permanent social and ecological systems. For Rosemary Morrow, this ‘pioneer’ work is driven by, what she calls, Social Permaculture. It’s the ‘invisible structures’ that Rosemary has applied and adapted to her work in war torn countries for 25 years or more. It is in these devastated communities where a permaculturalist must begin at the beginning, simply because there is not a lot of the invisible social structures left after war and anarchy (if any) to hold up any physical or ecological building project. To re-build the visible structures the invisible structures must first be put in place. If not, then the project, no matter what it is or how big or small it is, will fail. The fact that international aid has failed in Afghanistan is largely due to this. In the developed world we tend to take the invisible structures for granted. They are hidden away in the foundations of our social construction but are a vital and necessary part of making society work and for cultures to grow and thrive within it, whilst being resilient to the effects of corruption. In war-torn countries social breakdown brings the lack of invisible structures to the surface like sepsis from a wound, displaying not only corruption but also chronic health and hygiene problems, malnutrition, high rates of maternal and child mortality, homelessness, lack of education, lack of skills, almost no jobs, violence, etc., etc. In Afghanistan, as we can see in the film, the poorest Afghanis have little or none of these things. Particularly the widows. They have no land and no skills to work with, and the bioregional and national economic systems are almost non existent; kept down by corruption at all levels of government, bureaucracy and international opportunists. With the confusion that the foreign invasion has brought – the confusion of ‘winning hearts and minds’ with bullets and bombs packed with depleted uranium and a thousand metal shards – the rich industrialised West has not helped one bit in re-establishing either the local or the national prosperity that Afghanistan once enjoyed. Social Permaculture is all about ‘care for people’, which is one of the three permaculture ethics (the other two being care for the earth and share of surplus, or fair share). Pioneering permaculture into a place, any place, is not just bringing sustainable design into a landscape but also into a culture. Driven by ‘care for people’, pioneering permaculturalists are careful not to impose their ideas and methods onto the local people. They wait till they are asked and then listen and observe, laying the ground for working together as equals, where there is little room for superiority, unwanted agendas and everything else that comes with these. ..The very first design principle permaculturalists learn is ‘observe and interact’. Even before a permaculturalist begins her design to create a sustainable system on her inner city balcony, quarter acre suburban block or broad acre farm, she must spend a lot of time observing the ecological system already there. What’s the seasonal pattern of rainfall? In which direction do the cold winds come in winter? Or the dry hot winds in summer? How much sun does the property get and how much shade? Where are the micro-climates and what determines them? What’s the difference between them in terms of soil type and temperature? What insects, birds and animals visit the property? Which plants are there and which are not? A huge tree might be creating too much shade on the garden or house or perhaps it provides shelter from the harsh sun or strong winds? Is the tree deciduous, letting the sun in to warm the house in winter? Observation of all these things and more is vital to even begin to design a permaculture plan and implement it. It takes time, patience, presence and awareness to do so. When we understand that before we do anything on our own property, even before we make our plan, we must observe what is going on in the environment we are in, then we see that everything Rosemary says and does in the film is the first principle of permaculture in action, but directed primarily by the ethic of ‘care for people’. Preliminary and then on-going observation is essential for developing and evolving permanent systems in both the visible and invisible systems. In Social Permaculture observation, and hence listening, is the first step in caring for people, just as it is the first step in caring for the earth. In Afghanistan Rosemary was listening to and observing, and then acting on, many aspects of the people’s needs, including the need to create legal documents for the children, establishing children’s rights in the orphanage, creating clear and transparent accounts and an organisational structure that is fair. Rosemary is guided by Maslow’s Hierarchy of Needs and knows that the basic physiological and safety needs must be looked after before anything else. Again, fitting into what was said earlier, permanent food systems can’t be created until there is some level of stability, which only comes from setting up the ‘invisible’ systems that support it. ..Together with observing, Rosemary is ‘interacting’ with the people, thus becoming more aware of their levels of need, gaining an understanding of their level of stability, or instability, and most or all of their social impingements. Examples are: the status of women, children’s rights, access to doctors, food, water, shelter, fire wood, education, the potential to grow food again, etc., etc. Outside of the organisation Rosemary was finding out what other NGOs were doing and looking at the possibilities for introducing Permaculture at local and national levels; understanding what resources have been destroyed and what remain, what physical and biological resources are available on location, water availability, what it would take to build the soils up, etc, etc. 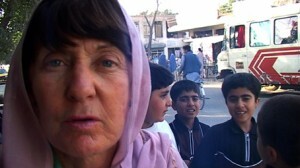 As Rosemary lives and breathes permaculture just by her being in Afghanistan she is constantly gathering all the information needed to make up a good permaculture design plan. In recent conversation Rosemary emphasised that, “If we care for people then we must have an eye for these structures”. On this first trip to Afghanistan, in the short time of two months, Rosemary implemented the preliminary needs of Mahboba’s Promise, supporting Mahboba and Uncle Haji in their work, enabling them to become a more effective organisation. Rosemary’s work also helped Mahboba’s Promise establish some stability for the women and children in their care – a level of stability that they had not seen for a long time, and for the children for the first time ever. Without stability there can be no movement towards peace and prosperity. Rosemary’s introduction of a Code of Ethics is another practical example of helping lay the ground for stability, fostering transparency, equality and non-violence amongst a war-torn people in a war-torn land. ..Metaphorically speaking, Mahboba’s Promise is a tree in the vast garden of Afghanistan which is giving refuge to a tiny patch of parched seedlings; protecting them from further damage. Rosemary’s work then, fostering transparency, equality and non-violence, creates a social ‘compost’ which can then be dug into the soil beneath the tree, so life will be able to grow and eventually thrive once more. As we can see in the film, it is already happening at this very early stage. You can see it in the children. In the years since, Mahboba’s Promise has become a fantastic fertile micro-climate in ‘the garden at the end of the world’. Note: This topic will be fleshed out in any future film sequel. Please: add to this topic with your thoughts and comments below. 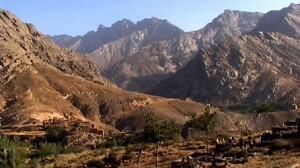 Click here for an update on Permaculture in Afghanistan. Gary, a very eloquent summary of the [too-often] overlooked aspects of permaculture. There is a better, more effective approach to overseas aid and development: PERMACULTURE. We applaud Rosemary, Geoff, Rick and other permaculturists working to make a positive change in our world – thank you. Thanks Matthew. Spot on. The more discussion this creates the better for all.